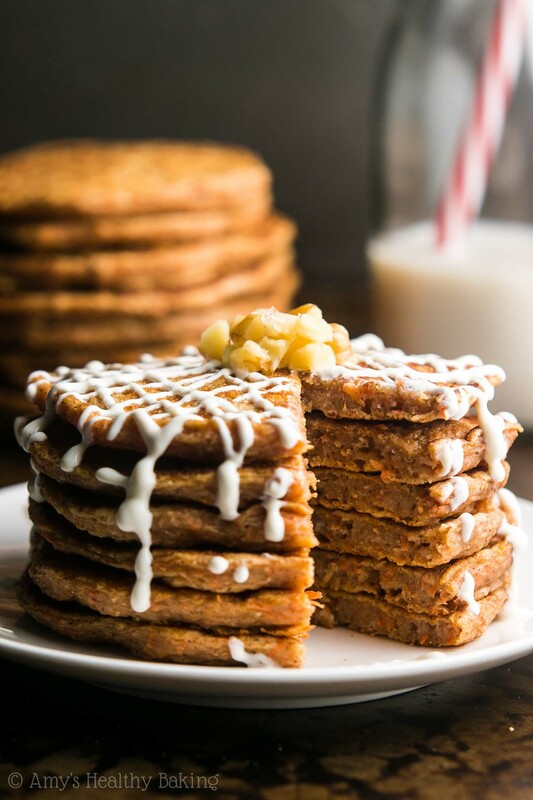 An easy & healthy breakfast recipe that tastes just like the classic dessert! With their irresistible cozy spices & sweet cream cheese drizzle, there are never any leftovers when we make them! Every morning during our #FreshCoastRetreat in Michigan last month (I’m sharing a recap blog post this weekend with lots of photos! ), a different group of bloggers would cook breakfast for the rest of the group in the humongous, magazine-worthy kitchen of the spacious house where we stayed, located directly on Muskegon Lake. With a fridge and freezer twice the size of stereotypical models and a walk-in pantry larger than most bathrooms, we always had plenty of delicious options to choose from! Liz, Dara, and Phi picked a variety of recipes from each of our blogs to prepare and serve throughout our trip, but they typically selected low-key, easier ones for the first meal of the day, like Lee’s breakfast potatoes and Dara’s fruit salad, so nobody had to set alarm to go off before the sun rose. We usually stayed up late—many times past midnight!—the evenings before, sitting around the fireplace talking, laughing, and trading stories, so we wanted to sleep in as long as we could! On our second morning, those three ladies arranged for us to enjoy build-your-own Stonyfield yogurt parfaits as well as a pancake bar, both surrounded by a plethora of toppings: Bob’s Red Mill muesli and muesli, strawberries, bananas, peanut butter, honey, maple syrup… And more! While the yogurt parfait ingredients took very little time to prepare, just a few minutes of slicing fruit and setting out bowls, the pancakes required close to an hour to mix together the batter and cook batches on the stove. Gina volunteered for that, dolloping perfect circles onto pans, flipping them when they turned golden brown, and sliding them onto a serving tray for us to stack high on our plates. Such a sweet lady! 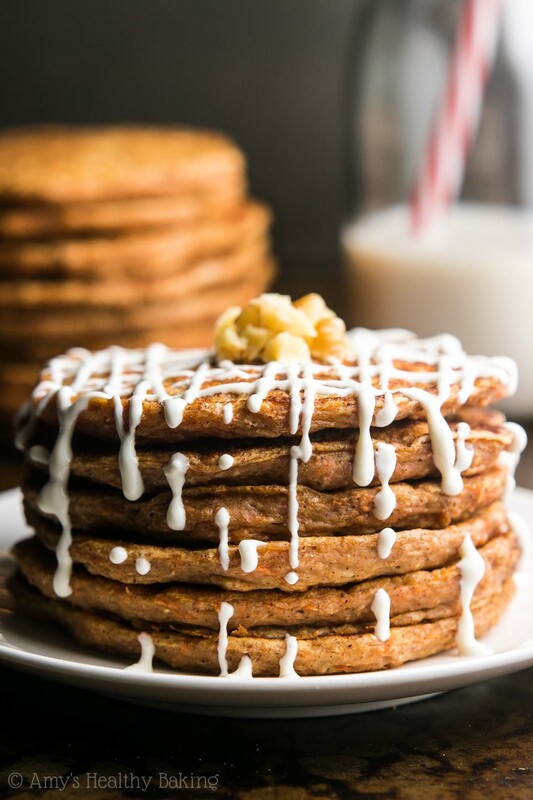 And Gina’s perfect pancakes inspired me to cook my own when I returned home, although I put a fun twist on my batch rather than going with classic buttermilk ones… I made these Carrot Cake Pancakes instead! 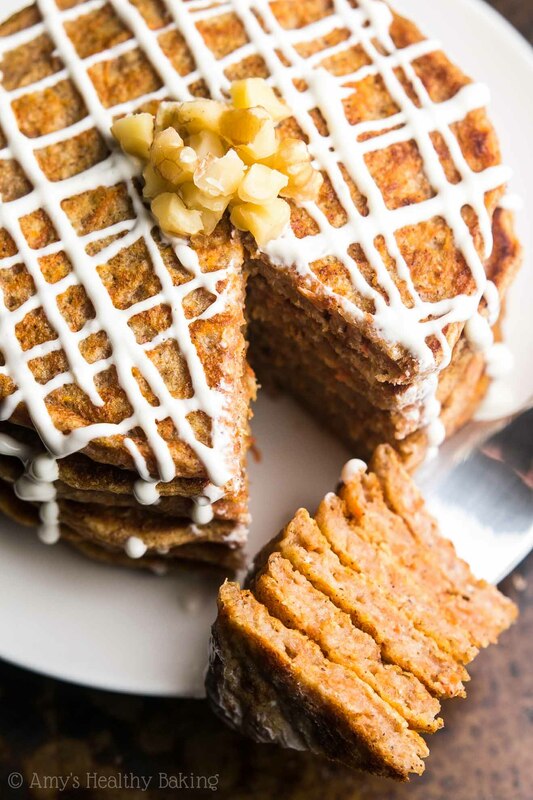 With the same cozy flavors as the iconic dessert, this healthy breakfast really tastes like that cake, especially with that protein-packed cream cheese drizzle on top! 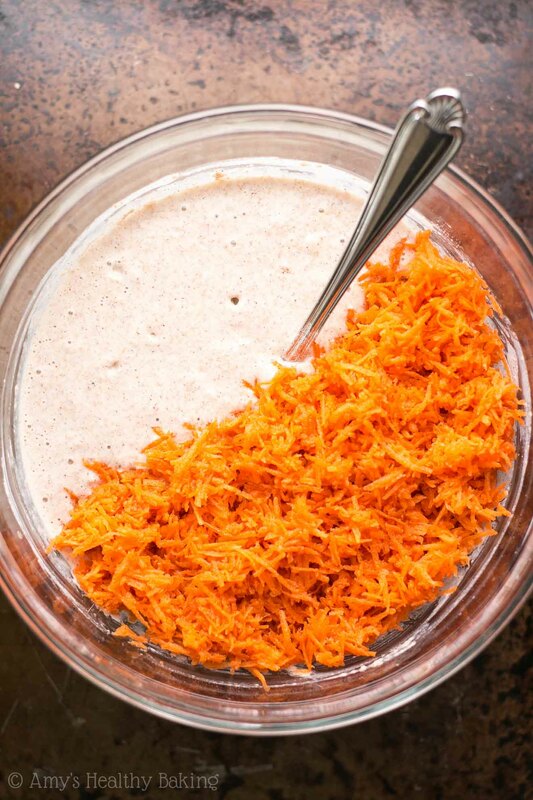 You’ll need a few key ingredients for that classic carrot cake taste, starting with freshly grated carrots, of course! 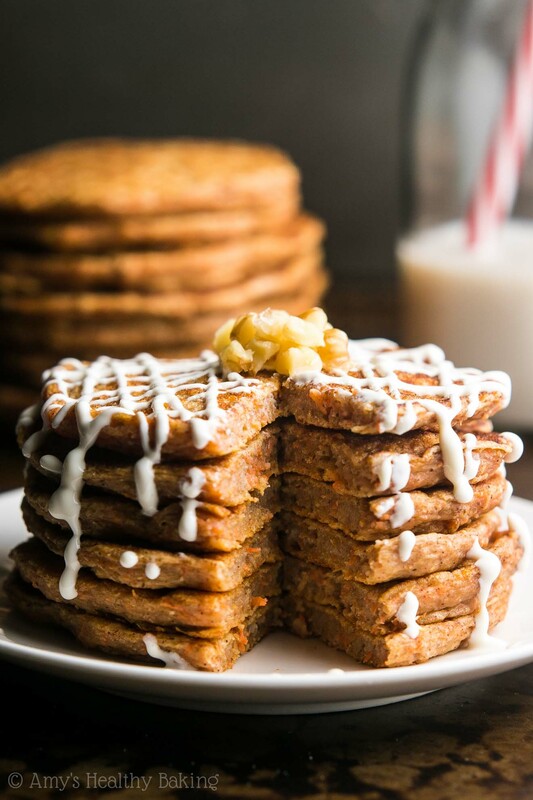 Because pancakes cook for such a short period of time, it’s important to use the smallest holes of a box grater when preparing the carrots (aka the size you’d use for finely grated/shredded cheese). 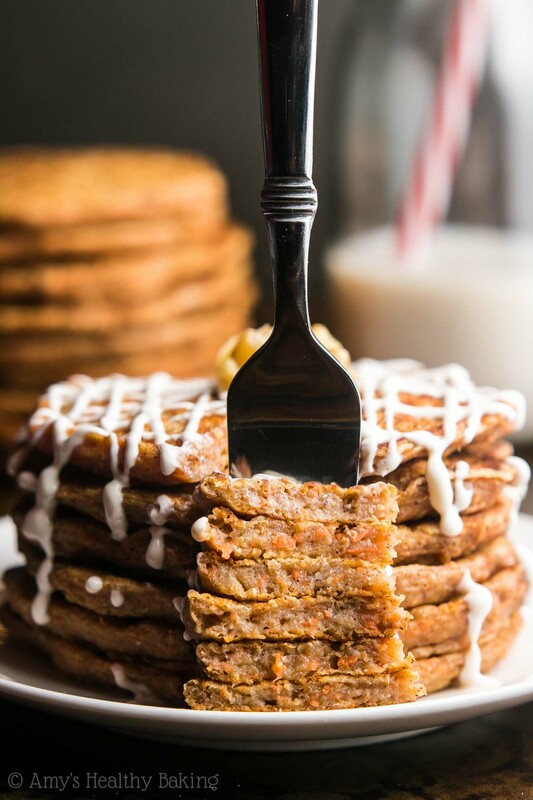 The standard size yields thicker pieces of carrot, and those won’t soften nearly as much during the pancakes’ short time cooking on the stove. 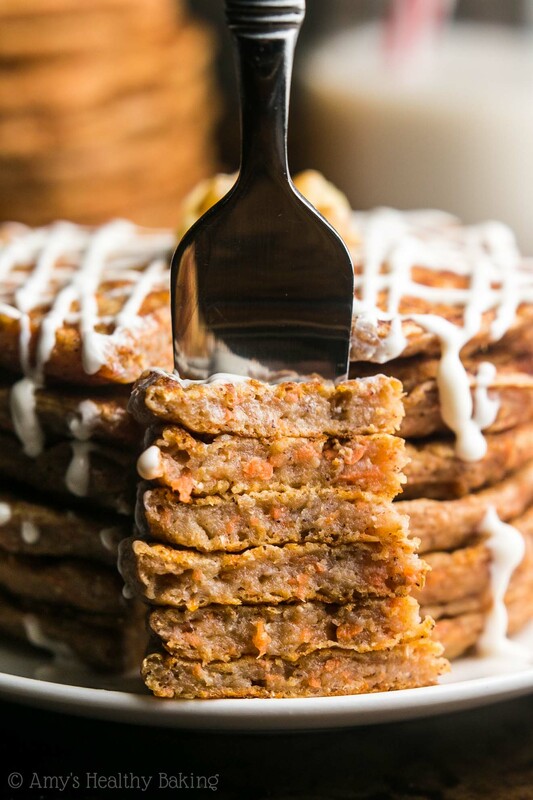 The other iconic part of carrot cake’s flavor comes from its spices, so you’ll need both ground cinnamon and ground nutmeg. Just a tiny bit of the latter! While cinnamon provides the majority of that warm and cozy taste, nutmeg adds extra depth and richness. Don’t skip it! Now for the fun part… The cream cheese drizzle! 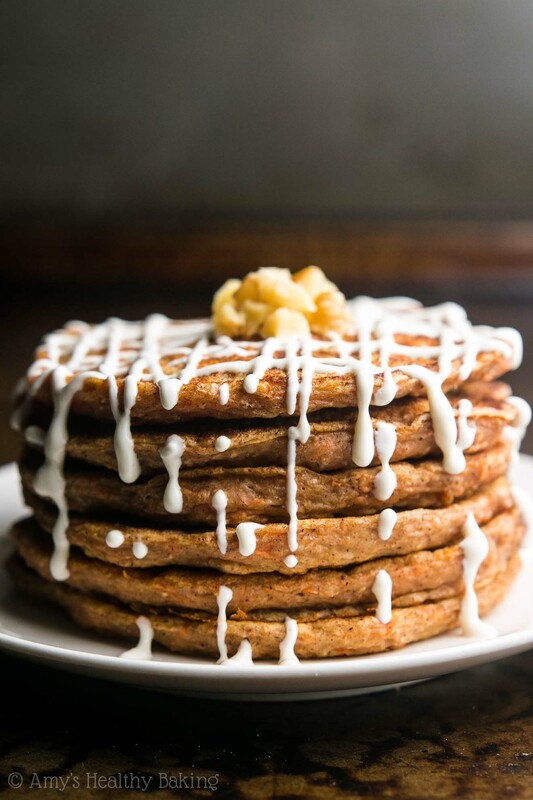 Carrot cake isn’t complete without the cream cheese frosting, so neither are our pancakes! You’ll use Greek yogurt cream cheese to make the drizzle healthier. I found mine at Safeway (their own Lucerne brand), and many Walmart stores stock this brand as well. In a pinch, well-softened Neufchâtel cream cheese would work, too. Time to dig in! And when you make your own, remember to snap a picture and share it with me on Instagram using #amyshealthybaking. I’d love to see your pancakes! 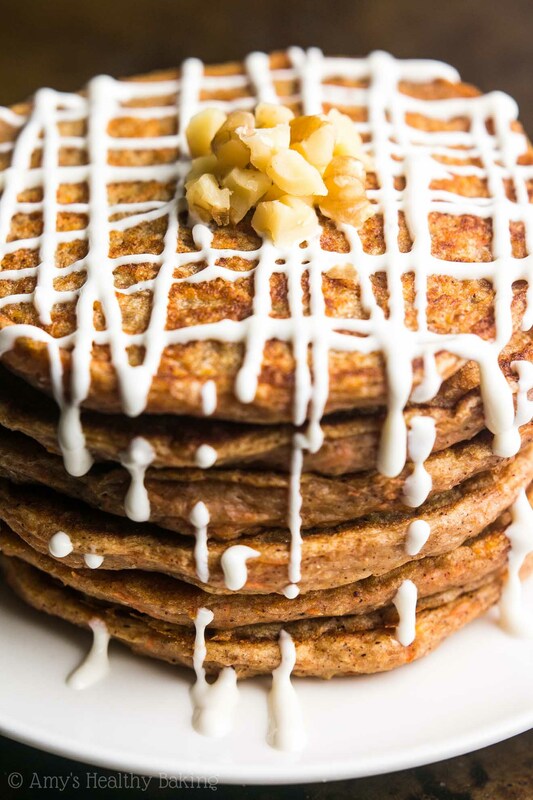 These healthy pancakes taste just like the classic dessert, complete with a cream cheese drizzle! The recipe is easily doubled to serve more. The leftovers will keep for at least 4 days if stored in an airtight container in the refrigerator, and they freeze really well, too. To prepare the drizzle, stir together the Greek yogurt cream cheese, milk, and stevia in a small bowl. Transfer the mixture to a zip-topped bag. Set aside. To prepare the pancakes, whisk together the flour, baking powder, cinnamon, nutmeg, and salt in a medium bowl. In a separate bowl, stir together the butter, vanilla, and maple syrup. Mix in the Greek yogurt, stirring until no large lumps remain. (If the butter or coconut oil re-solidifies, briefly microwave the mixture for 10-15 seconds.) Alternate between adding the flour mixture and the milk, beginning and ending with the flour, stirring just until incorporated. (For best results, add the flour mixture in 4 equal parts.) Gently fold in the carrots. Lightly coat a large nonstick pan or griddle with nonstick cooking spray, and preheat over low heat. Using 2 tablespoons of batter for each pancake, dollop onto the hot pan, and spread into a circular shape if desired. Let the pancakes cook for 2-3 minutes, or until a slight skin starts to form around the edges and the bottom is light golden brown. Slide a spatula underneath, and flip. Continue to cook for another 1-2 minutes or until light golden brown on both sides. Just before serving, cut off a small corner of the zip-topped bag. Top the pancakes with the cream cheese drizzle and pure maple syrup, if desired. Notes: Well-softened Neufchâtel cream cheese may be substituted for the Greek yogurt cream cheese. In the drizzle, 1 teaspoon of pure maple syrup may be substituted for the vanilla crème stevia. If using this substitution, omit the milk. For the gluten-free flour, I recommend the following blend: ½ cup (60g) millet flour, ¼ cup (30g) tapioca flour, ¼ cup (30g) brown rice flour, and ½ teaspoon xanthan gum. Many store-bought gluten-free flour blends will work as well, if measured like this. Whole wheat pastry flour, white whole wheat flour, or all-purpose flour may be substituted in place of the whole wheat flour. For the best results, use the smallest holes of a box grater to grate the carrots. The standard-sized holes yield grated carrots that don’t fully soften while cooking. Do not substitute store-bought pre-shredded carrots. They’re much drier and will not soften while cooking. For cooking tips, see the text and pictures in this blog post.